The degree of pulmonary stenosis is variable. Infundibular (subvalvar) stenosis is common and is often dynamic, but stenosis may also include hypoplasia and dysplasia of the pulmonary valve as well as main pulmonary artery hypoplasia (supravalvar). Right ventricular outflow tract obstruction causes increased right ventricular pressure and can lead to right to left shunting across the VSD in addition to decreased pulmonary blood flow leading to cyanosis. In the setting of mild pulmonary stenosis, shunting across the VSD is predominantly left to right and patients are acyanotic. This is clinically referred to as a “pink Tet”. 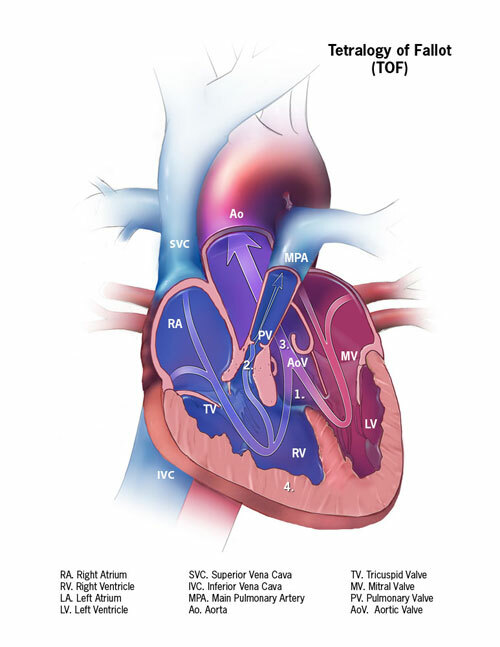 The typical ventricular septal defect in TOF is a conoventricular septal defect with anterior malalignment, resulting in anterior, superior and leftward deviation of the conal septum causing narrowing of the right ventricular outflow tract. Right ventricular hypertrophy component is the consequence of right ventricular pressure rather than a primary morphologic feature but adds to the right ventricular outflow obstruction.